Artisanal and small-scale gold mining is the main source of human exposure to mercury (Hg) in many countries. 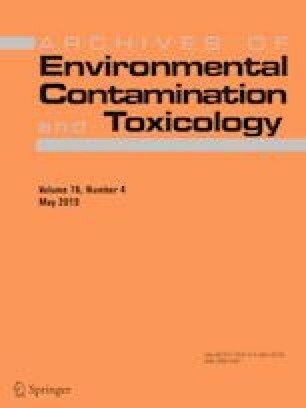 This study was designed to evaluate total Hg (T-Hg) concentrations in human hair, fish, soil, and air from two major gold-mining districts (GMDs) at the department of Bolivar, Colombia. Total Hg was analyzed using a direct Hg analyzer. The mean T-Hg concentration in hair samples was 3.07 ± 0.14 μg/g (range 0.15–25.1 μg/g; median 2.02 μg/g). The highest Hg level was observed in Mojana GMD, specifically at Achi-La Raya (9.2 ± 0.6 μg/g) and the lowest in Morales, at the Middle Magdalena GMD (1.50 ± 0.16 μg/g). Hair T-Hg values exceeded the U.S. Environmental Protection Agency reference level of 1.0 μg/g. Correlation between T-Hg in hair and stature was negative for the Mojana, but the opposite for Middle Magdalena, although for both GMDs hair T-Hg correlated positively with fish intake. The highest average T-Hg fish concentrations were observed in Caquetaia kraussii (0.37 ± 0.10 μg/g), Sorubim cuspicaudus (0.32 ± 0.16 μg/g), Plagioscion surinamensis (0.22 ± 0.02 μg/g), Trachelyopterus insignis (0.20 ± 0.02 μg/g), and Pseudoplatystoma magdaleniatum (0.20 ± 0.02 μg/g). Human health risk assessment of Hg based on fish consumption suggested that, with the exception of P. magdalenae, all economically important fish species are potentially harmful for the communities. Soil Hg levels in amalgam burning facilities were extremely high, and Hg in the air around mines and gold-processing shops exceeded international guidelines. In short, Hg pollution in GMDs of Bolivar is extensive, and this situation requires special attention to reduce environmental and human health problems. The online version of this article ( https://doi.org/10.1007/s00244-019-00609-w) contains supplementary material, which is available to authorized users. The authors thank the National Program for Doctoral Formation (COLCIENCIAS, 567-2012) and the Government of the State of Bolivar, Colombia.